First public appearance: Saturday, September 16th at 8:30 am, Tradex in Abbotsford. Dale Carlisle and Karen Baillie, CEO, debut the Duet Bike to Menno Place residents and board members. 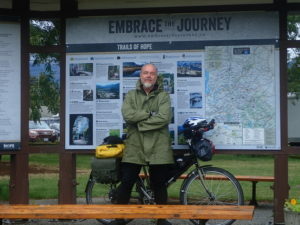 [Press Release, Abbotsford BC] – One bicycle, four provinces, 1,700 kilometers – this was the journey that Dale Carlisle, Recreation Aide at Menno Place embarked on to raise awareness of Alzheimer’s Disease in Western Canada last fall. In his daily work, Dale supports those living with dementia through a walking program, a woodworking club and the new Duet Bike initiative at Menno Place. A lifelong cyclist, Dale was set into motion when a close friend was diagnosed with a rapid form of early-onset Alzheimer’s disease. Dale at the end of his 21 day, 1,700 km ride across Western Canada. Dale challenged himself to bike from Winnipeg to Abbotsford to spark conversations about dementia with everyone along the way. For 21 days, through never-ceasing rain, idyllic prairies, and stunning mountain passes, Dale worked his way across Western Canada, achieving his goal of encouraging authentic conversations about living with dementia. Dale’s love of cycling is the reason that he jumped at the opportunity to be the champion behind the new Duet Bike initiative at Menno Place. 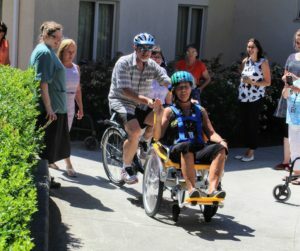 The Duet Bike is a two-part adaptive bicycle that allows a resident to sit in a modified wheelchair while someone pedals and steers behind them. It is a well thought out design that provides the ability for a resident to experience cycling outdoors safely in the company of a trained companion. On September 16, Dale and a Menno Place resident will launch the Duet Bike initiative at the MCC Ride for Hope, bring yet another measure of awareness and conversation to those who see these joy-filled cyclists ride by.